Gifts from the Pirates: "You are the music while the music lasts." Music is really important to me and Mrs M, It's what first brought us together when we met. Turned out we both liked a lot of the same music which was quite surprising as most of it wasn't mainstream. We've both got very eclectic taste and tend to like a bit of everything. When we first met we swapped iPod's and would spend each night sending texts on what songs to listen to at that specific time (i literally spent most of my days over the first 2 months with my headphones permanently attatched to my ears even going to the loo). Around Christmas time i decided to buy 2 matching iPod's and had them filled with both of our iTunes libraries so that when we were apart we could text and be listening to the same songs at the same time even though we were in different cities. It made being apart that little bit more bearable. We decided to make a playlist of all our favourite songs, the songs that made us feel better when we were apart and the songs that we listened to together when we would sit on the train or uni bus with a multi jack in an iPod. 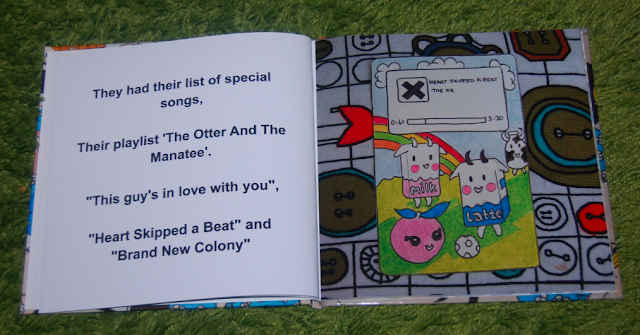 Our playlist is called 'An Otter and a Manatee'. This post is just a collection of some of the songs on our playlist that got us through a difficult few months and continue to make me realise how amazing Mrs M is and how lucky i was to have met her when i did. Over the years ive come into contact with so many people that when asked what kind of music they like they have answered "i don't really like music". Life would be so grim without music i don't know how anyone could say that. I love how hearing a song can transport you somewhere to a time or place whether it be good or bad. Its a very powerful thing. The playlist is 94 songs long and ever growing. were always listening to new things so things get added all the time, id love the playlist to be the background noise for our wedding party when it finally gets here. When the evening gets to 20:00 you can be pretty sure that Mrs M will start to go a little crazy and extremely hyperactive as it is creeping up to that point of the evening i thought it fitting to include the song that fuels the crazyness.